As expected we ran out of Freezer and Fridge space and we installed the new industrial cooler just in the nick of time. 5 new hops added to the lineup as of June 1. We have a very limited stock of Simcoe, Amarrillo, and Centennial so we request that you help share the luplin love by limiting yourself to 6oz of each type per month. In a short amount of time, Amarillo has become incredibly popular in the craft brewing and homebrewing world. A dual purpose hop most commonly used for its flowery, citrus-like aroma with medium bittering value that is gaining acceptance as a substitute for Cascade due to its hardy nature. A new, super high alpha hop derived from the Columbus/Tomahawk/Zeus cultivar. Most commonly used as a bittering hop, but has some excellent, very citrusy aroma qualities. Sometimes referred to as "Super Cascade," Centennial bares many of the qualities of Cascade, with higher alpha acids, and a spicier character.Flowers & citrus most evident. A medium aroma with mid to high bittering value makes it a dual purpose choice. A new aroma hop from Hopsteiner. This moderate alpha acid hop is a cross between Cascade and Fuggle and perfect for aroma additions. It is mild and pleasant, slightly spicy with a hint of citrus. A hop variety less than 10 years old that is quickly finding its way into the hearts of bitter-loving craft brewers. Intense pine aroma adds to the fresh, youthful vigor. Dual purpose but generally considered a bittering hop. Bravo Hops is a super alpha new-comer to the world of brewing. Roger Jeske used open pollination techniques during 2000, using Zues, and this Powdery Mildew resistant variety came to life. Bravo Hops is makes an excellent bittering hops with an alpha acid rating of 14%-17%. It is also known for its fruit and floral aroma, making it ideal for American Style Pale Ales, or India Pale Ales. Bravo is going to work well with Imperial Reds as well, or anything needing some kick to it. Falconer's Seven Seas (or 7C's), as you can imagine, this is a custom blend of 7 of the "C" hops and a few experimental hop varieties that we don't even know about yet. Falconer’s Flight 7C’s delivers strong fruit and citrus characteristics but is layered with spicy, earthy overtones that allow it to function as the perfect addition/alternative to your IPA / Pale Ale style brews. Targeted brewing values are 9.5% Alpha, 4.4% Beta and 29% Co-humulone. 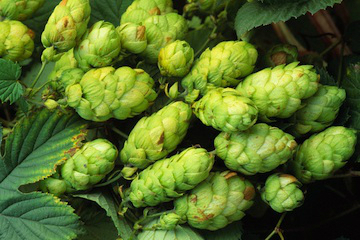 Hallertaur Magnum, or Magnum, is commonly used as a base bittering hops in many recipes. It provides the bitter foundation from which to build upon. Hallertauer Magnum has a somewhat unnoticeable aroma. And although this lack of character which gives so many other varieties their luster, it comes as an asset for this variety as it offers the brewer a different type of tool for the pot. Hallertauer Magnum has high an alpha acid rating of 12.0%-14.0%. And although the essential oils are very present, and the total oil within the cones is on the high side, the overall combination along with the genetics downplay their overall influence. These characteristics combined, make Hallertauer Magnum extremely appropriate for early boil additions. Super Galena is a super high alpha variety developed by the Hopsteiner breeding program and released in 2006. It has relatively high contents of both alpha and beta acids, making it a good bittering hop with pleasant aroma. Super Galena Hops exceeds in bringing a clean crisp bitterness, and this makes it suitable for nearly any type of beer needing kick. This variety has higher myrcene oil content than most hops. Myrcene itself has the smell of sweet fruits such as grapes and peaches, while at the same time having essence of woody, or grassy elements. The balance of myrcene with the other oils brings a moderate and pleasant aroma, making it applicable for aroma additions. For those that have read this far you are truly a beer geek so I will let you in on a little secret. I have been able to work a deal and get a small amount of Centennial, Amarillo and Simcoe hops. They should arrive in the next week and will be availabe for purchase shortly thereafter.